is learning to receive love. When Jessy Monroe is stranded at a Minnesota bus stop during a raging blizzard, the last thing she expects is the kindness of a stranger. When Michael Forrester invites Jessy to share the holidays with his family, the last thing he expects is to fall in love. Jessy, used to being alone and lonely, treasures the gift of Michael and his family. But the specter of his gorgeous ex-wife and her own inner demons threaten to take away everything she holds dear. To have the life she's always dreamed of, Jessy must fight her insecurity and learn how to let Michael — and his family — love her just as she is. "A charming, heartwarming love story. Ms. Brock handles the heroine's self esteem issues regarding her weight with sensitivity, and yet with a realism with which many readers will be able to identity....Ms. Brock has crafted a superb romance novel that had this reader giving a huge sigh of satisfaction at its end." "Rebecca Brock has woven the lives of two people from different walks of life into a beautiful love story. Jessy Monroe is down on love and has convinced herself that she will never find anyone to spend her life with. Michael Forrester, a single dad raising three children, isn't looking for love, but there's something about Jessy he can't resist. When a cold, stormy night brings them together, both their lives will change. 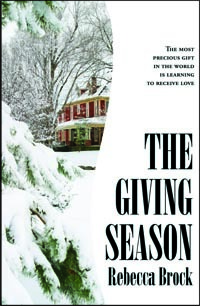 The Giving Season will grab you from the very first page and keep you turning pages until the end."